The Three of Pentacles tarot card demonstrates the process of inspiration and the satisfaction derived from work. Every great project begins with an abstract idea. Transformed into a plan or blueprint with clarity and passion, this idea can then be executed with skill. Its beauty inspires others in turn. The Three of Pentacles tarot card further teaches that the intangible rewards of labor are just as important as monetary compensation. After all, it is quite possible to hate a million dollar job. In the Three of Pentacles card, we cannot see what image the sculptor is carving here. The blueprint in the nun’s hand is not much help, either. From our perspective, the image is much too sketchy to convey even the hint of an idea. This shows us that the love of work is not only a gateway to the inner mysteries, it is a powerful mystery itself. This is the secret that makes some people get up before dawn, work long hours, and still be a pleasure to have around when they return home in the evening. The fact that the sculptor in the Three of Pentacles card is in a monastery means that every aspect of his work is of a spiritual nature. The building is made from grey brickwork, symbolizing that the general context of his labors is based on solid, eternal principles. 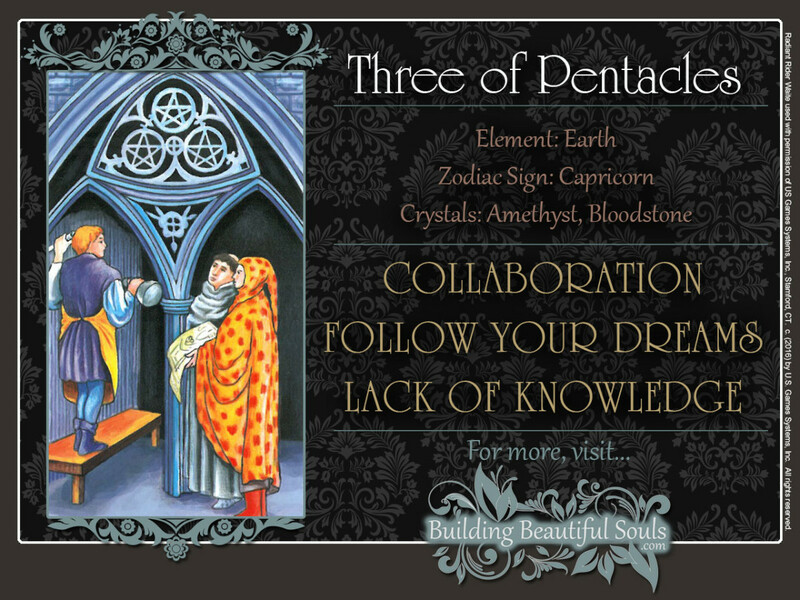 The human figures in the Three of Pentacles tarot card are framed by three gothic arches. In the Middle Age, gothic architecture made it possible to construct the tallest and sturdiest buildings of the time. The pentacles in the Three of Pentacles are arranged in an equal armed triangle, representing the divine spark with its male and female aspects. The center point is a Celtic cross, a symbol of divinity and perfect balance. It also marks the center of the rose below, showing that passion and spirituality go hand in hand. The monk in the Three of Pentacles represents the urge to create something beautiful, but it is the nun in her red cloak who is shaping this urge into a form that can be implemented as a physical work of art: She is the architect. 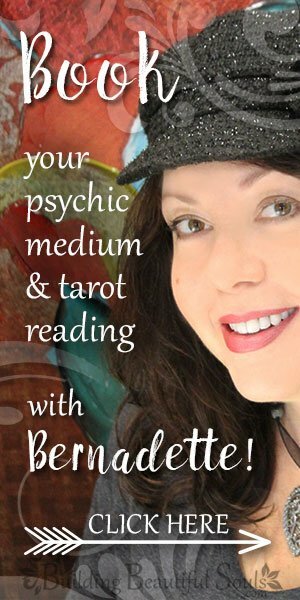 When The Three of Pentacles card presents itself in a tarot reading, it’s a beautiful omen that your life is about to enter a self-sustaining rhythm, in which vision, passion, and work energize one another! You now find it easier to apply yourself to a task, because the rewards are material as well as emotional. Being able to interpret constructive criticism as the positive advice it is meant to be, you can also provide feedback in a nonthreatening manner, helping others to learn and grow. In this process, you are learning and growing, as well. Psychotherapist Wilhelm Reich (1897-1957) expressed this principle as follows, “Love, work, and knowledge are the wellsprings of our life. And they shall also govern it.” It’s a principle that is serving you well at this point in your life, benefiting you materially as well as spiritually. If you are currently seeking employment, this card spells good news; something wonderful is headed your way. While this job will meet your economic needs, the joy it brings you will outweigh its material benefits. If you are already employed, your superiors have been watching your progress. They are happy with your performance and more importantly, your attitude: a perfect combination of cheerfulness and productivity – and they are determined to reward it. An exciting new project may come your way soon. Perhaps you’re even slated for a promotion. All this said, The Three of Pentacles tarot card is letting signals that the time has come when you can definitely be trusted with more responsibility. Your sense of dedication and genuine pride in your work inspires others, and rather than looking at you with envy, they strive to follow your example. They wonder what your secret is. The good news in that in time, they will discover it on their own. While you certainly view this positive effect on others with satisfaction, your work also gives you a sense of your place in the world. This realization is a powerful, deeply spiritual mystery in own right. When reversed, the Three of Pentacles tarot card warns that the interplay of work, passion, and vision is disrupted. The reasons for this could be within you or in your environment. The situation in question may involve the workplace, but the problems suggested in this card can apply to any scenario requiring social interaction. Sometimes it takes a while to develop a productive work rhythm. Once the novelty of working in a new job – even if it’s your dream job – wears off, you realize that part of your responsibilities most certainly includes doing things that are tedious and frustrating. Rock star self-improvement speaker Larry Winget has said that as much as he loves his job, 90% of it includes doing things he positively hates – such as spending long hours waiting in airport terminals, sleeping in hotels during the week, and arguing over cancelled reservations. Living out of a suitcase can get old quickly, no matter how fancy the hotels may be. Singing to yourself, “Grey skies are gonna’ clear up. Put on a happy face.” will do wonders to help you over that hump. It allows you to keep going as you buy time to improve your attitude. However, if things don’t improve in the long run, you are either not the right person for the job, or this is not the right job for you. In this case, you would be well advised to start looking for something else. You cannot control the hearts and minds of others and quite often, the best attitude in the world and the most stellar performance record are no defense against the egos and hangups of other people. If your project partners shower you with praise while shifting the bulk of the workload onto you, the feeling you’ve been had may be justified. Here, it is important to acknowledge your own worth and assert yourself! In traditional Numerology, Number 3 corresponds to Jupiter, symbolizing generosity and prosperity. On the Kabbalistic Tree of life, it is associated with the feminine aspect of deity, shaping and giving birth to a powerful, but undefined impulse to create. In the suit of Pentacles, this creative process manifests itself in a way that can be experienced with our physical senses.